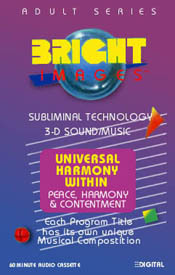 This program is specific to providing peace to ones inner self. It creates the inner balance to a persons life by developing the ability to feel at peace within yourself and with those who are around you. Provided feelings of peace, love, self-respect, harmony, relaxation, health, positive thinking, creativity, enjoyment, responsibility, happiness and success from within. Works on a persons belief system in them self and their ability to be a peace with themselves.